Arcadia is being dragged down into Inferno! The Angels who once guarded it have been captured! You and up to three other players must gather your guilds, load them with gear, and venture into a world of fire and damnation. The Underlord must be defeated before he can corrupt the angels and doom Arcadia for all time! 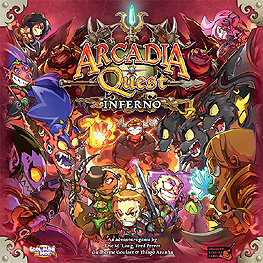 Arcadia Quest: Inferno is a standalone game, and also compatible with the original Arcadia Quest/ In it, players build their guilds with 3 Heroes from a roster of 12, each of whom has their own unique abilities. As they progress through the branching campaign, fighting their way down against the demons of Inferno, the Heroes earn new weapons, abilities, and magical items! Players use this loot in combination with their special abilities to become the most powerful guild in Arcadia. Arcadia Quest's unique PvPvE gameplay allows you to target monsters and fellow players alike. In Inferno, Heroes will always be tempted by Damnation. This insidious power can give you a boost when you most need it, but it might come back to haunt you later on. Rescuing the trapped Angels allow you to add them to your Guild of Heroes, but the ones you don't save will return as vengeful enemies! Recruit unique Heroes, earn powerful loot, and build unstoppable combinations that decimate monsters. Dominate the other guilds with no game master required.